I found boring after using Windows default cursors. I get my cursors at Deviantart.com. 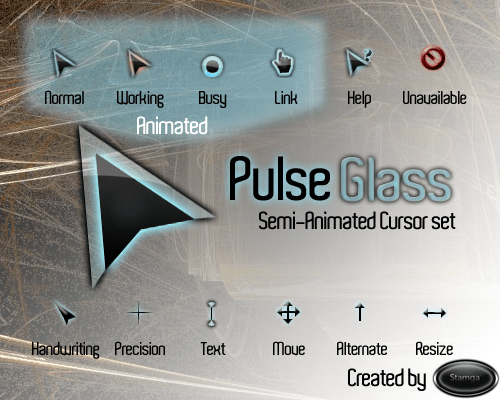 You may also try some of the beautiful and useful cursors. I suffered flash player issues in Windows 8, I am guessing after a Microsoft Windows Update. I am not talking about Metro IE. Desktop IE 10 wouldn’t play flash content at all. Every web site I visit IE or website complained I don’t have Flash installed. Adobe Flash support/help is good for IE 10. But it didn’t help me at all. Blogs and Newsgroups were blabbering about I have to use desktop IE browser for Flash support. I have tried to update Windows, but there was no updates. I tried to uninstall updates from reverse date order. I even downloaded the Windows 8/IE 10 supported Flash Player ActiveX OCX files from Adobe and replaced it with my current files. It didn’t help either. Try IE10 now. Hope it works for you also. Leave me a Thanks note.